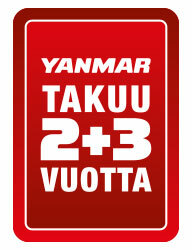 Yanmar warranty for 2 + 3 years. The Yanmar warranty for pleasure boats is 2 years or 2000 hours. The warranty begins on the day you start using the new engine. Registering your device makes it easier and faster to get in touch with a motor or when you contact your local dealer. Register your Yanmar diesel engine here . Or contact your Yanmar dealer.